After the negative results of a first study and the absence of literature on research on listening devices, Van Soest started to carry out systematic noise measurements in 1928. Fundamental research into stereo-acoustics took place from 1932 until 1936. Van Soest distinguished three important topics: the human ability to hear direction, the ability of listening devices to perform directionally well, and the influence of the atmosphere on sound propagation. Van Soest started with the simplest possible means to research the human capacity to determine the direction of a sound source. Remember that electronic means were either not available or primitive. Testing a person’s directional hearing ability with the listener’s hose, already used by the armed forces for existing factory equipment, gives an idea of the suitability of the listener to determine the direction of a sound source with a listening device. Van Soest determined the great importance of the time difference between the signals reaching the ears for hearing direction. With the listening hose it was possible to determine to what extent a person could properly hear direction. The listening hose, of which one example is present in the museum, is one of the components of which we did not understand the meaning before the archive study. It is a hose of about one meter long with two wooden caps at the ends and a marker line at the middle of the hose length. On the photo, you can see how the test works. The person to be tested at the left puts the caps onto his ears, closes his eyes and listens. The examiner on the right taps with an object on the hose. The test person must say whether the sound comes from the left, from the right, or from straightforward. In the tests carried out by Van Soest and his first employee Piet Groot, Van Soest determined that Groot had such a good sense of direction that he could not determine the accuracy of his directional hearing. Just next to the marker line, Groot indicated the right direction. From a veteran, who served in the Armed Forces in 1939 – 1940, we learned that military personnel were tested for directional sensitivity with a hose over their shoulders. That allowed the persons to keep they eyes open. In the museum, there are two wooden strips with a dot wax on the top containing a dental impression. 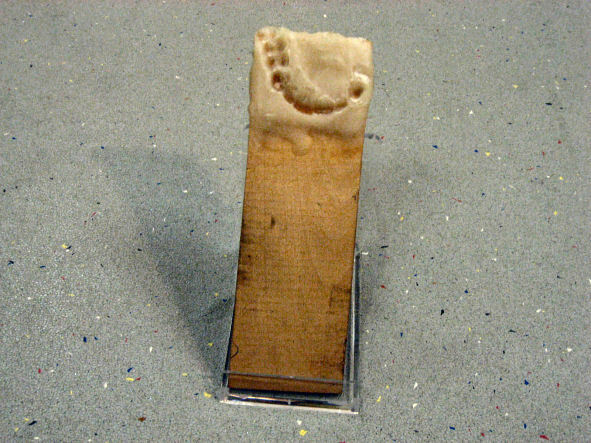 The archives provided a solution; these were the imprints of Van Soest’s and Groot’s dentures. These strips were used in the barrel test. A large barrel had been buried in the dune. When crouched down in the barrel, one’s head was just above the edge. On the round barrel edge, there was a locking device to fixate the wooden strip at every thirty degrees. There was a sound source at some distance from the barrel. The test person put his teeth in his wax print on the wooden strip which was fixed on the edge of the barrel. He had to stick a finger in one of his ears and listened to the sound source with the other ear. The source was slowly moved away from the barrel along a straight line. If the sound could no longer be heard, the test person raised a finger and the distance was noted down. With the wooden strip subsequently clamped on the next fixed angle, the sensitivity profile around the head and of each ear could be measured. One of the results of this investigation was that the usual large distance between two sound-receiving elements of a listening device was unnecessary for the average good listener. In the Meetgebouw, Van Soest and Groot reshaped Van Soest’s office into an acoustically dead room by decorating walls, ceiling and floor with jute and installing a cage covered with polishing cotton. In this room, they performed measurements with the aim of determining the directional sensitivity of their respective ears. The observer sat head-on completely silent in the middle of an imaginary sphere with a radius of three meters. On a part of this spherical surface, there are 25 points as indicated in the figure. The middle point is on the eye line. The other points are at angles of 10º or 20º horizontally and vertically. Subsequently, a sound generator was hung at each of these points. 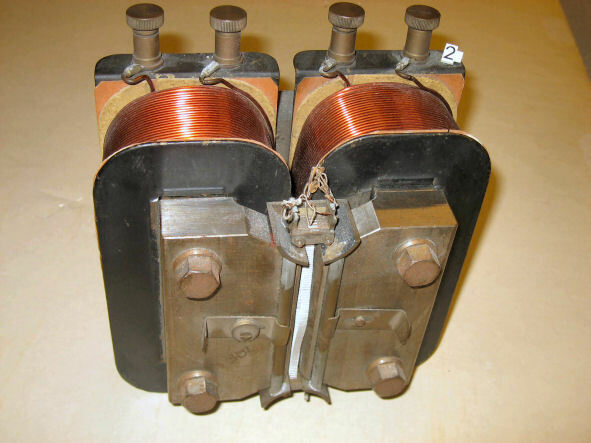 The sound generator periodically produced short sound impulses. While the sound generator was in action, the observer determined with closed eyes the direction from which he thought he heard the sound by pointing at it with his right forefinger. Then, after opening the eyes, he recorded the direction he had observed and the difference with the real location of the sound source. The deviations in degrees were accurately estimated and noted. The results of Van Soest and Groot are recorded in a figure. A Dutch article on this research dated February 1929 can be found here (pdf). When observing elevation, van Soest did tests by covering the ears with a plate containing a small hole. The observation in the (horizontal) map angle was as accurate as without a cover plate. However, locating the elevation was no longer possible. The conclusion was drawn that the ears play an important role in vertical directional hearing. The second result of his research was the discovery of the harmful effect of sound transport through metal pipes and rubber hoses because this caused weakening and distortion causing a disturbed sound image. Van Soest combined both finds. He created a parabolic sound mirror with a circular diameter of approximately 120 centimetres made of plaster which was covered by a paper layer at both sides. This sound mirror then cut in half. Each ear of a listener was placed in the focal point of one of the shell parts. Comparative tests on the Plain of Waalsdorp showed that this experimental device yielded far better results than the then state-of-the-art foreign military listening devices. Van Soest concluded that the refractive law of Snellius can be used for the propagation of sound in air, where pressure, moisture and temperature gradients cause refraction of the propagation direction of the sound. Moreover, refraction occurs because wind speeds just above the ground rise from zero at ground level to the maximum occurring wind speed at a certain height. In connection with the listening devices, such atmospheric studies had never been performed. Van Soest assembled a team consisting of Prof. Elias, Prof. dr. Zwikker, Dr. Zijlstra and himself to develop mathematical theories that describe the various refractive aspects on sound propagation. In the above figure, there is a temperature that increases upwards. In the figure below the temperature gradient towards the sky decreases. In the latter case, the sound source (in Dutch: bron) cannot be detected in the hatched areas. During practical measurements, it has been found that large angular deviations in the direction of observation and the actual direction of a sound source can occur with occurring gradients. These angular deviations can be much greater than the deviations that occur as a result of the inaccuracy introduced by observing with listening devices. In 1929, research was started in parallel on various types of microphones, mainly to understand whether they could represent an improvement to the human hearing organ concerning the intensity and threshold of hearing sounds. The museum has measurement charts and equipment that were used to make parts of microphones. In 1930, a custom condenser microphone was built; in 1932 an electromagnetic strap microphone. The microphone tests ultimately did not meet the intended goal, the human ear proved to be much more sensitive.